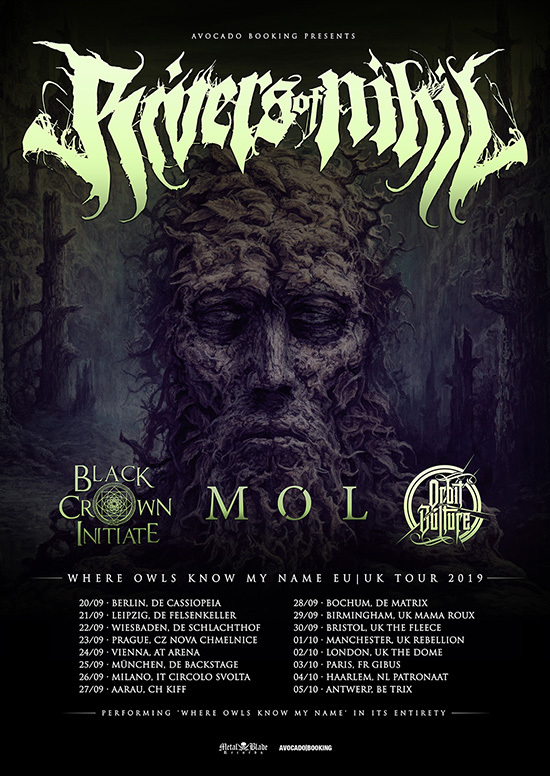 American metallers RIVERS OF NIHIL have just announced their first ever headline tour through Europe, taking place in September and October of 2019. Support comes from BLACK CROWN INITIATE, MØL and ORBIT CULTURE. Where Owls Know My Name- debuted on the Billboard and Canadian music charts upon its release in March: #3 Top New Artist Albums (Billboard / USA), #9 Current Hard Music Albums (Billboard / USA), #57 Top 200 Current Albums (Billboard / USA), #61 Top 200 Albums (Billboard / USA), #50 Top 200 Chart (Canada), #10 Top Hard Music Charts (Canada). Named “one of the best progressive death metal albums in years” (HeavyBlogIsHeavy.com) and one of “2018′s Best Metal Albums…So Far” (Loudwire.com).